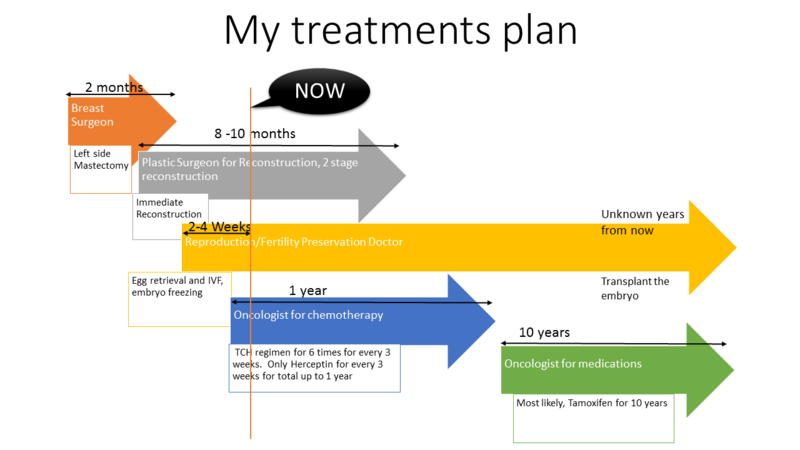 I wanted to share my treatment time line for a reference. (Please read “important” at the bottom, if you are diagnosed breast cancer.) As many of breast cancer cases, I did not feel a pain or sick at all. I felt perfectly healthy, in fact, I thought I was one of the most healthiest, or the most health conscious person around me. One major different thing about the cancer from other illness is that removing cancer with surgery is only the very first step (note: some cancer requires chemotherapy before surgery). Many other treatments to follow in breast cancer. When I found about about the length of the treatment I had to have, I was daunted to face that fact. Previously, I never had surgery, I did not take any medications regularly, and I even did not take any vitamins because I self-studied nutrition and my meals provided me balanced vitamins and minerals. Day 11: Almost normal. I took a long nap in the afternoon. I also did another bike ride! [physically] I can feel a mild body ache from yesterday’s exercise. I need some exercise. Mild nausea, but I did not take medication. I wake up feeling normal, but gradually my nausea reminds me that I am under chemotherapy treatment, (this is an improvement.) I had head ache and took Advil. My pimples are healing. I don’t digest food well, food comes out from me recognizable (I tried not to be very descriptive). [emotionally] Very steady. I can predict the next cycles. Not knowing what will happen to me was a big fear. Next cycle, I might be a little better to handle the cycle emotionally.